We began our working relationship with these particular customers at least 10 years ago and have worked on multiple projects for them throughout the years. These projects included the construction of their retaining walls as well as a backyard patio. So when they called and said they wanted to really upgrade the front yard landscaping for their North Arlington home, the challenge for us was that it already looked good! We began by meeting with the customers to get a full understanding of what they wanted to do to make their property really stand out. The interior of their home is tastefully appointed and the house itself is well-built, with a lot of architectural interest. They wanted to take that to the next level and renovate it to make their home and front yard landscaping more unique. So we worked with them to create a unique exterior that doesn’t mask the existing architectural features and charm of the house, which sits perched on a small hill. After all, you can’t buy positioning like that! 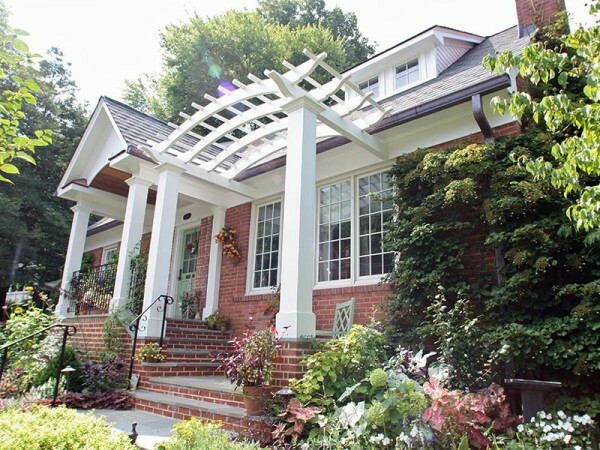 For this project, we worked with a talented architect, Mike Gaydos, to create landscape architecture as inspired as that of the home interior and brought in Hambleton Construction to do the carpentry work. But it was our in-house team of landscapers who was responsible for all of the brick masonry work, grading, and planting we used to transform the front yard landscaping. 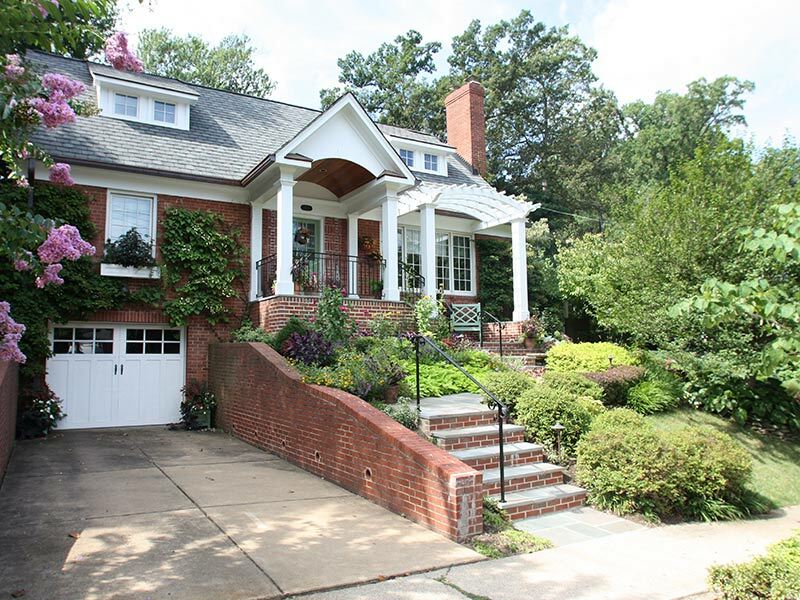 We wanted to enhance the house’s attractive brick exterior and large windows, so we used a combination of high-quality products to accomplish this, including copper gutters, bricks, shingles, and custom-made wrought iron railings. When it came to the brick masonry work, though, we faced aesthetic challenges. The brick and the mortar joints needed to match a 50-year-old house. 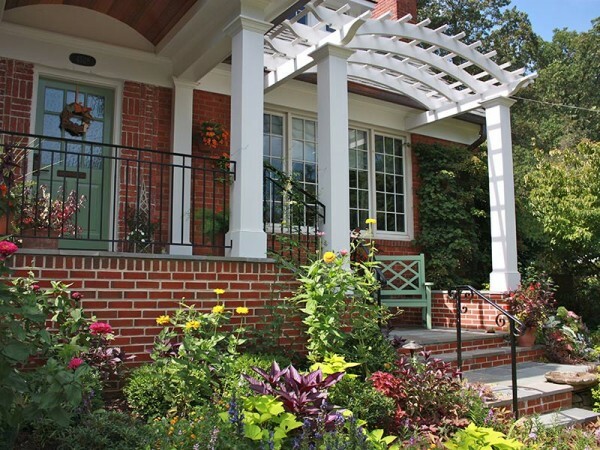 We overcame these obstacles to achieve an exterior look that complements the perfectly charming home interior. In all of our steps and landings, we used 1.5 inch thick thermal Flagstone, which has been milled to be uniform in thickness. Experience has shown us that step treads of varying thickness can detract from the final outcome. 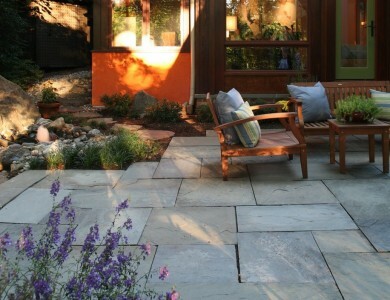 Techniques like these result in the more professional, cleaner-looking flagstone step and landing design that is O’Grady’s Landscape’s signature look. Often times, our customers say that they need low-maintenance plants because they don’t have the time or inclination for gardening. However, that was not the case here. 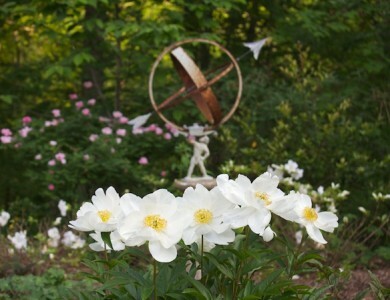 In fact, our North Arlington customers were very knowledgeable regarding plant material and played an integral role in both the design and installation of their greenscape. 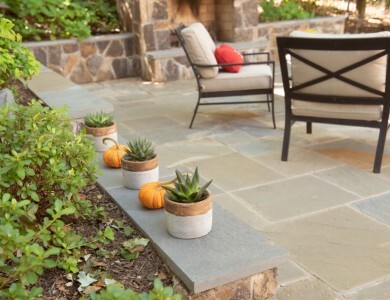 Together, we chose plant material that is summer-centric, very garden-like, and high-maintenance—but well worth the extra effort! Do you want to create a front yard landscaping design to match the look and feel of your home? 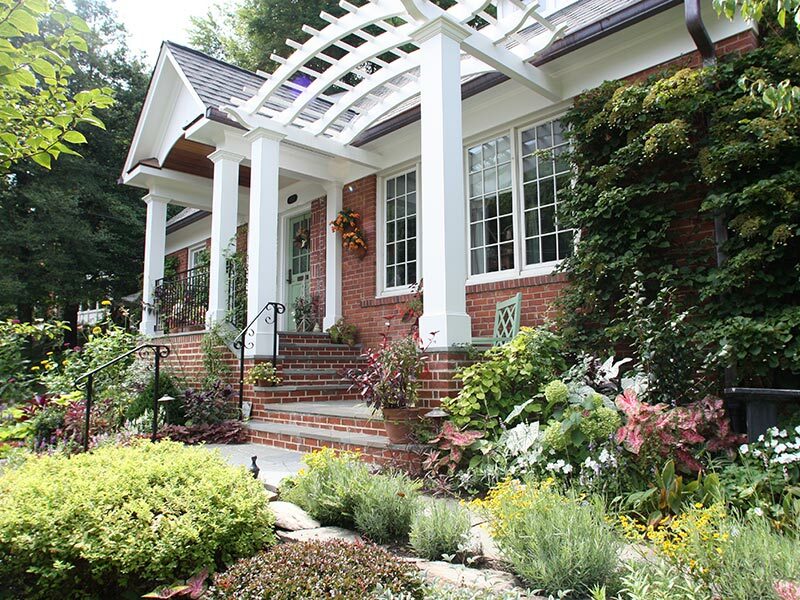 Let O’Grady’s Landscape design and install all your favorite features to give your property a unique look and a functional layout. 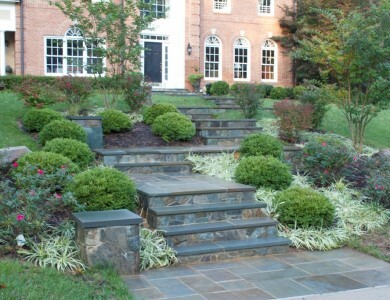 Whether you want help with brick masonry work, flagstone steps, summery plant material, or another combination of hardscapes, we’ve got you covered. Call us today to schedule a consultation for front yard landscaping in North Arlington, Vienna, Great Falls, the City of Falls Church, or McLean!